2013 is finally here, and with it the return to our normal routines and schedules.While I love the extra time off, and the extra time together around the holidays, the disruption can be a bit stressful in its own right. But we fit lots into our long weekend. I'm going to save you from my wordiness, and share it mostly in pictures. 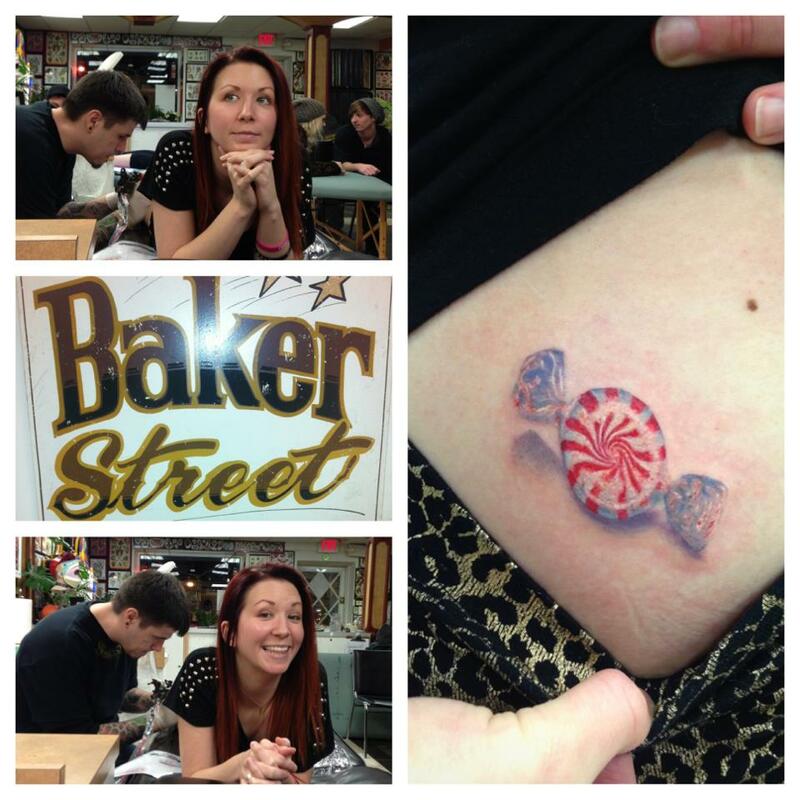 Friday was a half-day for me, and tattoo day for myself and Babs. I'm so excited about tattoo #9! It was to celebrate over 25 years of best friendship. We have an old joke ("You're sitting on your Mint! "), so we got these cute mints to make us laugh. It was great to see my girl. Saturday we finally got some real SNOW! Babs had to take off because she was worried about getting home later if the snow kept up. Gwen, Trav, Daisy, and I got dressed and took advantage though. Afterwards we made some hot chocolate, popped in a movie, and warmed up together. Sunday was pretty lazy. I headed to the Quaker Meeting, then we all went grocery shopping. Lily came too, thank goodness for double carts. Monday was a girls' day while daddy was at work. We hit up the store, the library, and had lots of silly time. That night we headed to Ro and Pat's for NYE. We figured, since it was a special night, we'd let Gwen stay up a little late. Well she apparently got a second wind at some point, and we couldn't settle her enough to fall asleep until almost 11pm!! We headed home just after midnight. Tuesday Gwen slept in until about 9am, thank goodness. We had a lazy morning, then Trav headed to Pappy's to do some cleaning. They decided to see the house in the spring, so he figured he'd start trying to straighten it up a bit. Gwen and I hit up the tennis courts for some tricycle riding time. Gwen ended up sleeping (in her crib, without waking to come to bed with us) until 7 this morning, which was very nice! She clearly still needed the sleep, and we were grateful for it too. Now its back to work and daycare, and getting out schedules back on track.